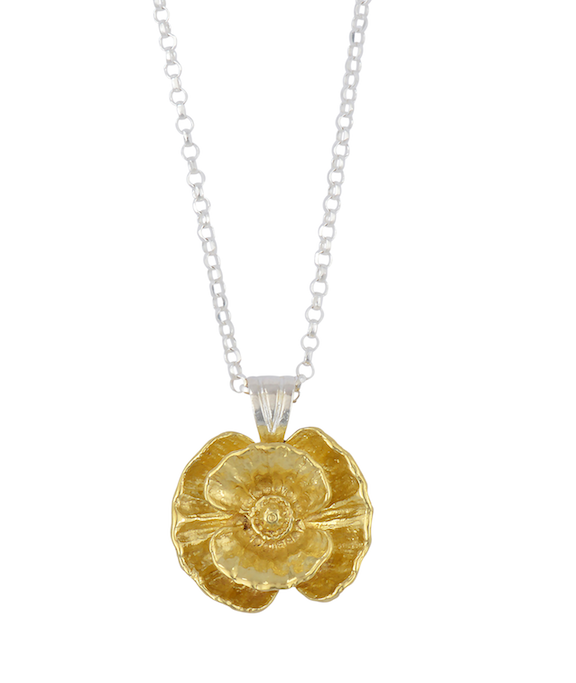 Jewellery doesn’t come much more unique than this elegant and stylish poppy necklace from the Royal British Legion. This pretty necklace which has been commissioned to help commemorate the Centenary of the First World War (1914-1918). 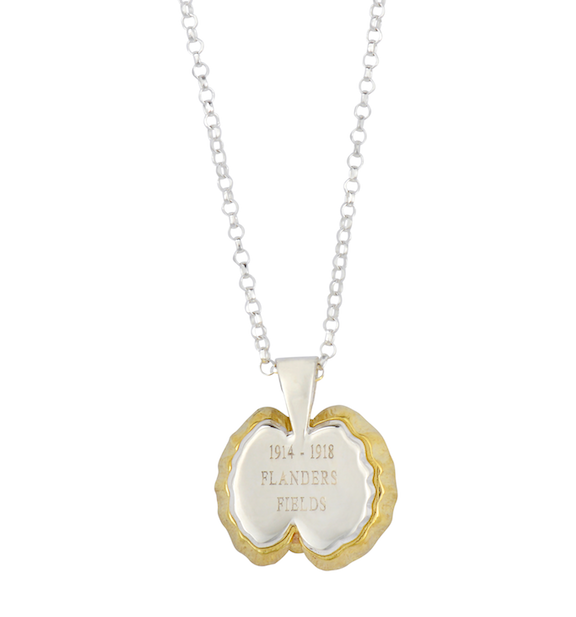 The design of the unique and exclusive Centenary Flanders Fields Poppy Necklace is based on a 100 year old dried and flattened real poppy from Private Len Smith’s diary. Private Smith, a veteran who lived until 1974, plucked the poppy from No Man’s Land in 1915 and preserved it in his illustrated diary. Artist Stephen Allen then created a sculpture of the poppy for TMB Art Metal of London to use as the model for the necklace. The necklaces have been created from the solid brass artillery shell fuses found on First World War battlefields. The shells have been melted down and cast, using the traditional ‘lost wax’ method in which each and every poppy requires a wax version, into the hand sculpted poppy designs. 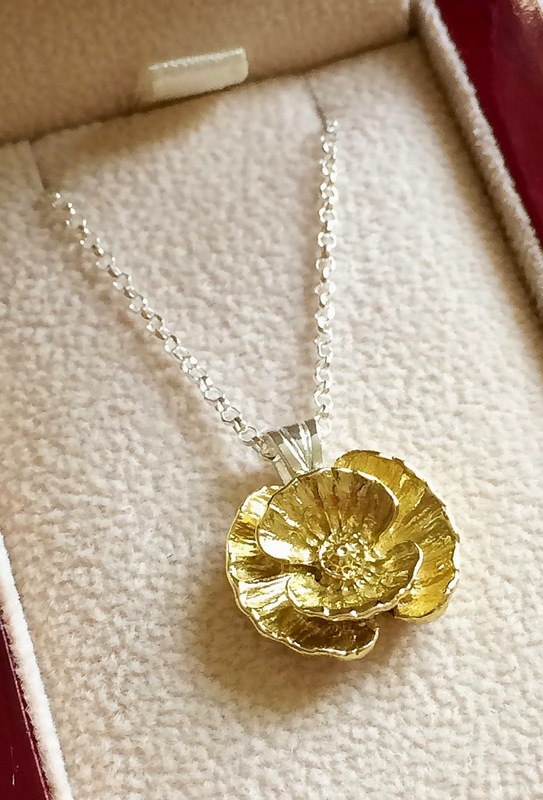 Each necklace features a contrasting sterling silver backing plate on which the brass poppy is mounted upon an 18” diamond cut Belcher style silver chain. Each is engraved on their reverse with ‘1914-1918 Flanders Fields’ and is accompanied by a certificate of provenance and presented in a high quality case. All profits raised from the sale of the necklaces goes directly to The Royal British Legion. The Royal British Legion do incredibly valuable work in supporting the members of the British Armed Forces and their families. The necklace is available exclusively from The Poppy Shop and is priced at £79.99. As you can see the design is very pretty and I think this is a lovely way to support a charity, and perhaps wear in memory of a relative. They also do this design as a set of cufflinks which is also priced at £79.99. Thank you! My contact details are on the PR section of my blog. I'm actually pretty jealous you have one of these. They're so beautiful and the cause is pretty close to my heart too. Still kicking myself I didn't apply to get one of the display poppies. They have a lot of jewellery on their website, it's worth a look if you are after something in particular. I love anything with flowers on, and this is a beautiful piece. It is a lovely necklace and it's great that the money goes to a good cause. It is beautiful I agree! Thanks for your comment Michelle. It would make a lovely present. Thanks for your comment Anne. It is a lovely necklace and a great way to support a charity as you say. Thanks Brandon, I think it's a lovely necklace too.